I recently received some fragrances from Milton-Lloyd. 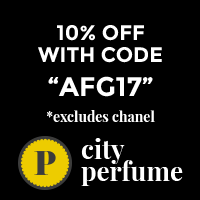 They are a UK based perfume company that specializes in good perfumes at great prices. In case you didn’t know it, I love a bargain. Sure, I have been known to spend a hefty amount on a bottle of juice but my heart sings when I find a good deal. I’m also not too snooty to think that only the expensive perfumes smell good. I’m also a fan of perfumes that remind me of other perfumes. Sometimes I like a scent but not enough to justify the price. If I find something similar for less I’m a happy girl. Pink is a floral perfume that is incredibly soft on me. I’ve been wearing it as a bedtime scent because on my skin it’s just a subtle wash of fragrance. Your skin may react differently. It reminds me of those billowy vintage roses that smell of powder and spice but not really rose. I find it to be reminiscent of carnation probably from the lily and geranium notes. I do like this fragrance and the overall effect is like a bouquet rendered in watercolors. If you like perfumes on the soft side, think Pink. Purple is my least favorite of the bunch but Purple garnered quite a few compliments for me so I guess it smells better to everyone else. I like it but it isn’t love. It’s listed on the Milton-Lloyd site as a fruity chypre but to me it’s a watery, slightly sweet floral fruit-chouli. It’s not overly fruity surprisingly, and is a much more wearable perfume than a lot of others of this genre. Starts off a bit like an upscale shampoo but then settles into a pleasant floral. I couldn’t detect oakmoss. Smells like a lot of popular mainstream scents and the people I work with really liked it. Femme Gold opens with a burst of juicy fruits then blooms with lily and jasmine. This one reminds me of another perfume but I can’t for the life of me think of which one it is. The name Femme Gold is fitting because all the notes are covered with golden honey and caramel. To my untrained nose it’s an oriental gourmand without a lot of spice. It is a bit sweet yet since it doesn’t smell like fruit salad I do like it. I’m a sucker for lilies too. So tell me, have you tried any perfumes by Milton-Lloyd? Do you ever buy inexpensive perfumes or do you not even bother to sniff? I recently tried a perfume being sold at the supermarket for ~10€/50 mL in order to convince myself I was not a snob. How bad could it possibly be? Since this was at a supermarket, there was no testing paper, so I sprayed onto my wrist. It was strong and repulsive. As soon as I got home, I scrubbed and scrubbed, but the disgusting odor stuck to my skin. I wish I could remember what it was, but I now hesitate to touch super-cheap perfumes. I think we’ve all had that experience at one time or another. I wish someone could explain why the most repulsive scents cling to the skin so intensely. I can understand why you wouldn’t want to chance it again. When I’m in doubt I usually grab a tissue from my purse and test that before any skin is involved. I have and love many inexpensive perfumes. My Emeraude, Tabu,Loves Baby Soft And Loves Baby Soft Jasmine sit shoulder to shoulder with my Kilians and Amouages. Your Milton-Lloyd’s sound quite nice to me! How fabulous is Love’s Baby Soft? I don’t know why but I never get sick of that one. I must have some happy memory associations with it. I think Emeraude and Tabu are completely underrated and should be next to the Kilian’s. Hi Poodle! I’ve never tried anything from Milton-Lloyd, I don’t even recall ever reading about them before. Just went to their site and man are they inexpensive! I’m not snooty either, and I love a bargain! Honestly some of my favorite perfumes are the least expensive. I always have a 120ml bottle of Demeter’s Flower Show on hand and Silences in mass quantities since it’s been discontinued. Yardley’s stuff is also pretty darn good, my current favorite being their Iris. Madini’s oils are great and a little goes a long way, ditto Spiritual Sky’s Nag Champa and the Song of India Temple Oil that Erica wrote a post about here. I try to avoid going out of my way to sniff super expensive stuff and now I’ve started to check out prices before I buy a sample of something that I won’t ever be able to afford. Hi Holly! Some of their perfumes are pretty good dupes for more expensive ones. I’ll be reviewing one of those perhaps next time and honestly I like that Milton-Lloyd better than the real thing because it lasts longer on me. So far their perfumes have really good staying power on me except Pink. If you do a little googling you can find out which ones might be something you’d like. There are lots of perfumes I like and wouldn’t mind having but can’t justify the price. In those instances I like finding something that’s similar enough to make me happy. I have not tried Milton-Lloyd but will check them out right away. I buy and use BOTH cheap and (relatively) expensive fragrances. Like Holly, some of my favorite scents are the least expensive. That being said, I will NEVER, ever again pay more than $206 US for a full bottle of anything. Why $206? Three years ago I thought I was getting a super deal at $206 on a perfume originally listed at $395. This year the same thing showed up for $139 in the discount bins. In the past three years I have probably used no more than 20 sprays out of that 100 ml bottle. This may seem nit-picking but, considering the number of perfume purchases, this careless spending really adds up! Sigh. 😉 What price pleasure? After 8 hours there is not much difference between the pleasure of $10 and and the pleasure of $206! Ouch. In the discount bins… I really hate when that happens. Unless of course I don’t already own the perfume. I love stuff that’s really inexpensive because if I fall out of love with it or it turns I don’t feel quite so bad about it. A $20 mistake is easier to handle than a $200 one. That being said I will spend a decent amount on certain scents but I have a limit too. Sorry I’m late to the party, stuff has been exciting around here. LOVE a bargain. Glad you found a few to love. Better late than never. It’s even better if something exciting is involved. Hopefully it’s good excitement. You are so right. Price is no guarantee of quality. You’re not much of a mainstream scent kind of girl so these might not have enough to hold your interest. One nevers knows though. P.S. – I can’t wait to hear all about that new lipstick discovery. Thanks for the reviews. I Scent You a Day had reviews of a few Milton-Lloyd perfumes, but I didn’t realize they were available in the US. They’re all within my blind-buy limit, too.